In our house, up until fairly recently, beetroot had always been pickled in vinegar, either sliced or small whole ones and only eaten with a salad. I wasn’t a big fan when I was younger, but I guess we get to like more sour foods as we get older and I certainly did. I have been growing my own beetroot for a few years now, have never pickled them them, but instead I always roast them and found them great when eating slabs of grilled meat from the barbeque. Anyway this year I saw a recipe on Jamie’s 30 minute meals for a Beetroot and Feta Salad and it looked totally awesome so I thought I would give it a bash. It’s so simple and if you haven’t got your own beets you can buy them ready cooked and vacuum packed. 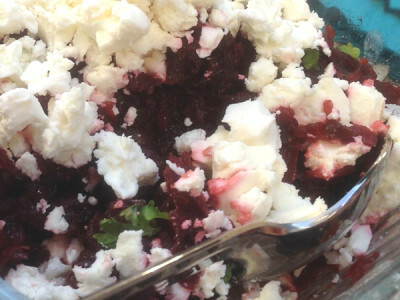 to prepare the Beetroot and Feta Salad, grate the beetroot in a food processor or with a box grater into a bowl and pour in a couple of tablespoons of balsamic vinegar and a drizzle of extra virgin olive oil. Squeeze in the juice of ½ a lemon. over the top then crumble over the feta.